Before digging into DEVONthink's improved automation commands and Workflow integration, it's important to explain what, exactly, DEVONtechnologies has changed. 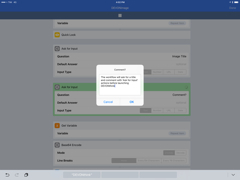 The latest DEVONthink To Go is fully compliant with the x-callback-url spec and can be chained with other apps to perform actions and return data to the calling app. 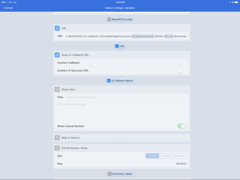 The primary reason for the adoption of x-callback-url is easy creation of actions in Workflow, but DEVONthink's URL scheme can be used by any other launchers on iOS – including Launcher, Launch Center Pro, Drafts, and even Safari bookmarklets. 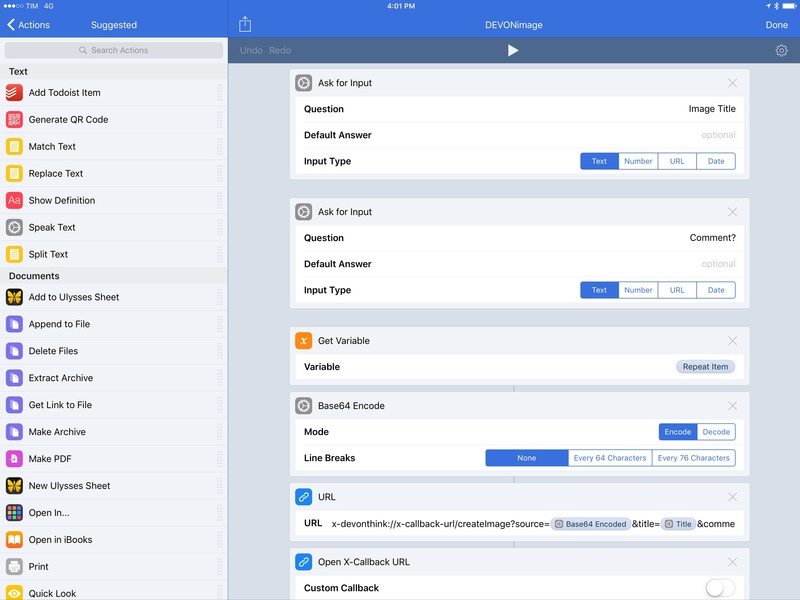 In this article, I'm going to focus on pre-made automations for the Workflow app. 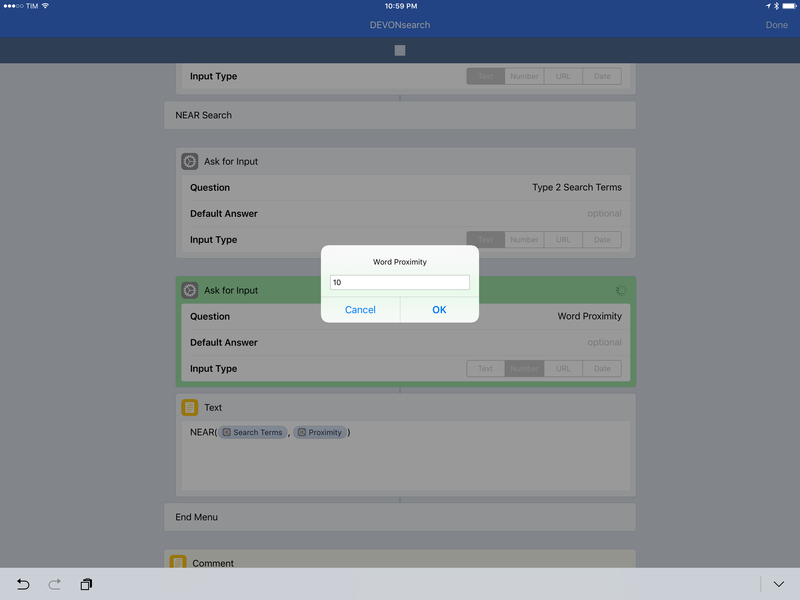 Perform a search and send back a list of results to another app. 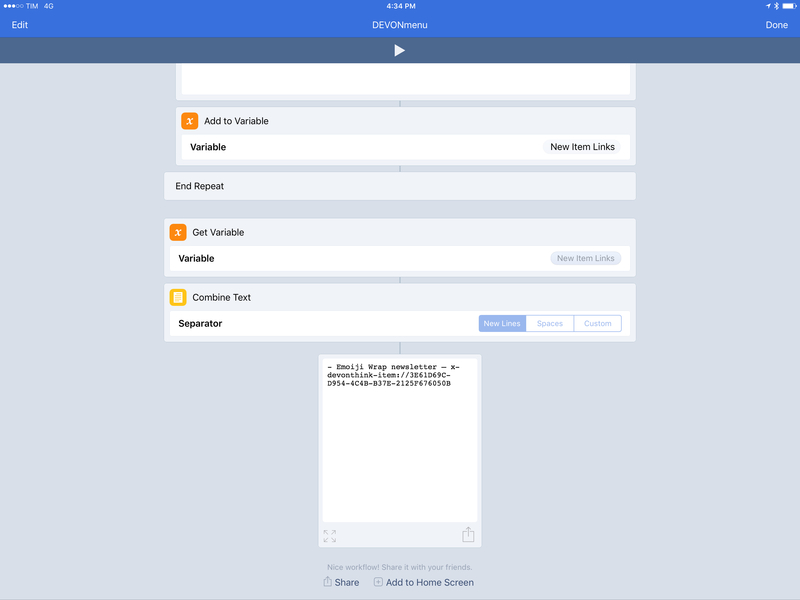 All of these commands are based on two core features that DEVONtechnologies implemented: base64 encoding to create new files in DEVONthink and retrieve their contents from other apps; and JSON objects to return file metadata or search results as dictionaries that can be parsed by Workflow. 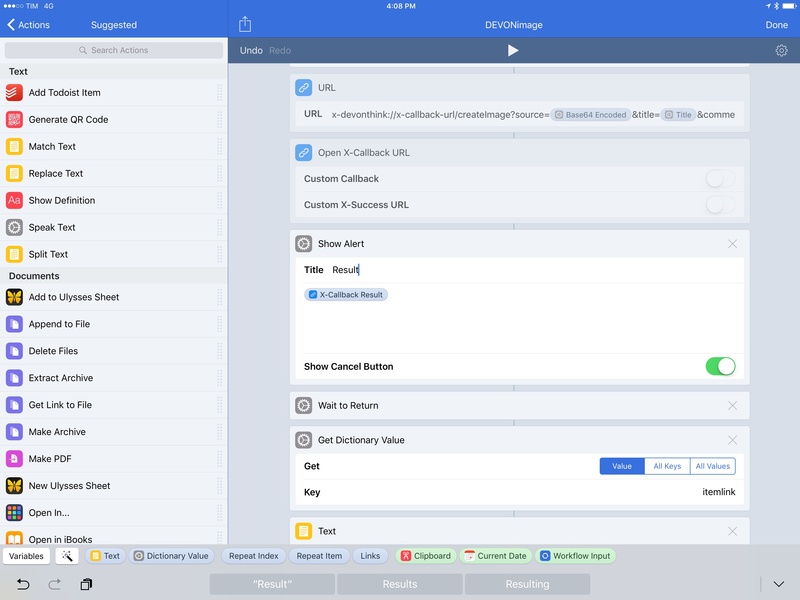 If you've been following the iOS automation scene lately, you might have spotted the trend towards base64 and JSON for files and search results, respectively. Once again, these are workarounds that some clever developers (including The Omni Group and Ulysses are leveraging to cram more information into URL schemes. Both base64-encoded strings and JSON objects can be included as plain text inside a URL scheme to let two apps communicate. Sprinkle some x-callback-url on top of everything, and you have a system to chain apps in complex automations that can pass images and PDFs around, or even return lists of hundreds of search results in a dictionary. None of these are optimal solutions, but it's all we have for now if we want to achieve desktop-level automation on iOS. The ideal conclusion, of course, is for Apple to end all this with a proper WorkflowKit framework and native automation that drops URL schemes altogether. If you're an iPad power user who's been keeping an eye on DEVONthink, I bet your automation senses are tingling at this point. Thus, allow me to explain how I've been taking advantage of DEVONthink's deeper automation and what I have in mind for my future usage of the app. I take a lot of screenshots on a daily basis. The number goes up dramatically in the summer when I'm writing my annual iOS reviews as I take hundreds of screenshots for every beta seed. There's no great way to reference individual images in Apple's Photos app, but that's an area where DEVONthink excels thanks to its item links – bookmarks for individual files that can be opened from other apps. There's only one problem: importing a new image into DEVONthink is too slow and takes too many taps. Enter the new createImage command in the DEVONthink URL scheme. Using this command, we can send an image to the app and create it in a specific group with a name and even a comment attached to it. Thus, rather than opening DEVONthink's file menu, picking an image, and then opening its metadata panel to type a comment, we can now do everything at once from Workflow, saving a lot of time. 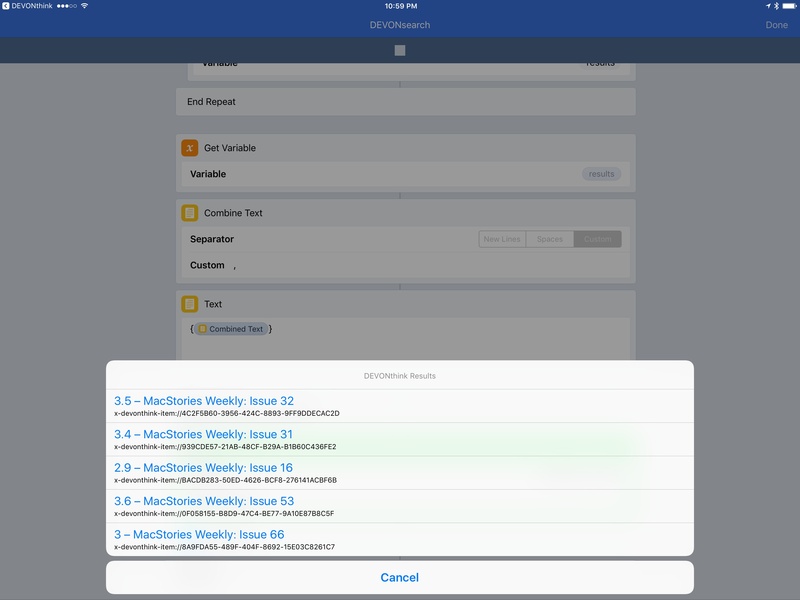 The workflow will ask for a title and comment with 'Ask for Input' actions before launching DEVONthink. 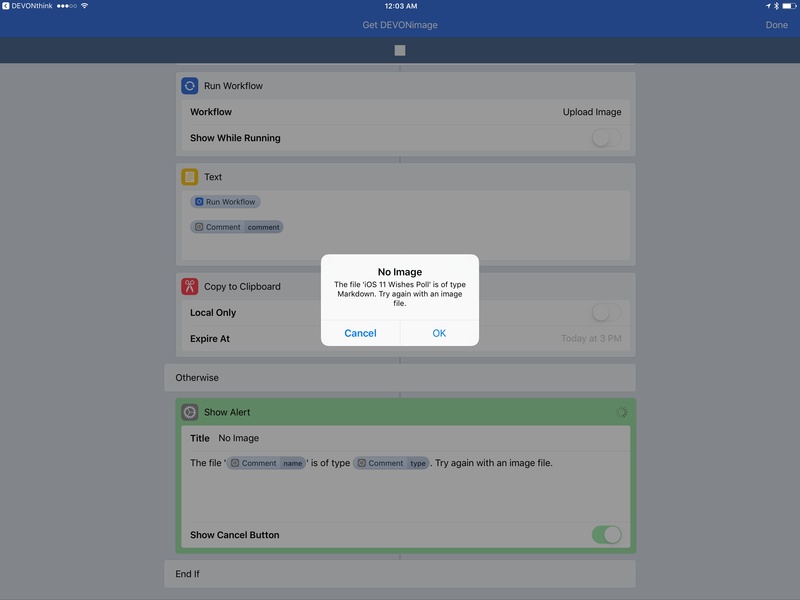 With the workflow I've put together, you can send images to DEVONthink in two ways: you can either manually pick them from a photo picker, or you can select some images in the Photos app and share them with the workflow via the action extension. 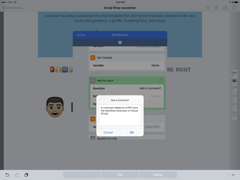 For each image you pick, Workflow will ask you to add a title (used as filename) and a comment; both are optional, but I recommend at least adding a title for context. Each image will then kick off DEVONthink's automation by opening the app, saving the file, and going back to Workflow to repeat the process for the following image. This is the magic of x-callback-url and repeat loops at play, and it's best used with Workflow in full-screen – not in Split View. 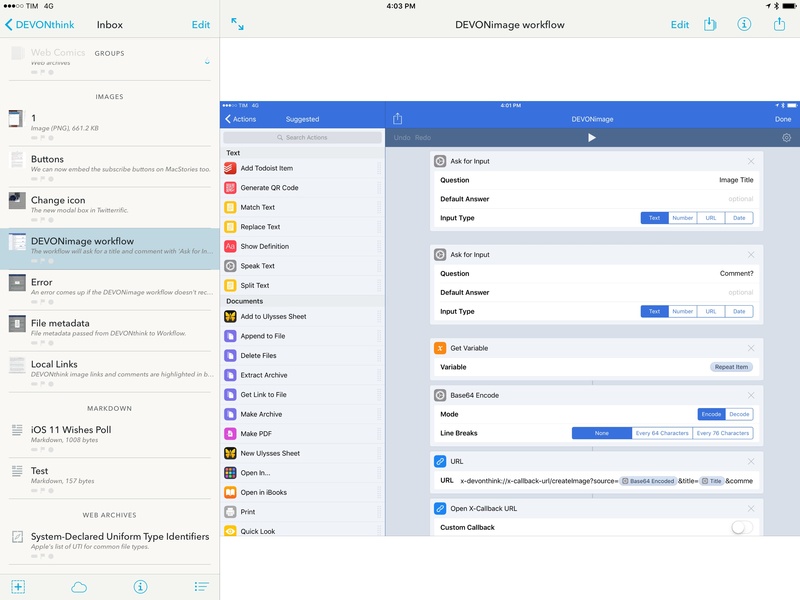 If you pick 10 images, Workflow and DEVONthink will switch between each other 10 times; it's not pretty to look at, but it works, and it speeds up image creation in the app considerably. Adding a comment for the image in Workflow. The image is created in DEVONthink via the URL command. The comment is also embedded with the image in DEVONthink. At the end the workflow, you'll end up with a list of DEVONthink item links in your clipboard, which you can save in a note to reference each individual file you've just created in DEVONthink. The output of the DEVONimage workflow: title, item link, and comment. Adding an image to DEVONthink using Workflow. There's an aspect of this automation I want to highlight, and it's how Workflow visually exposes the x-success parameter sent back by DEVONthink. 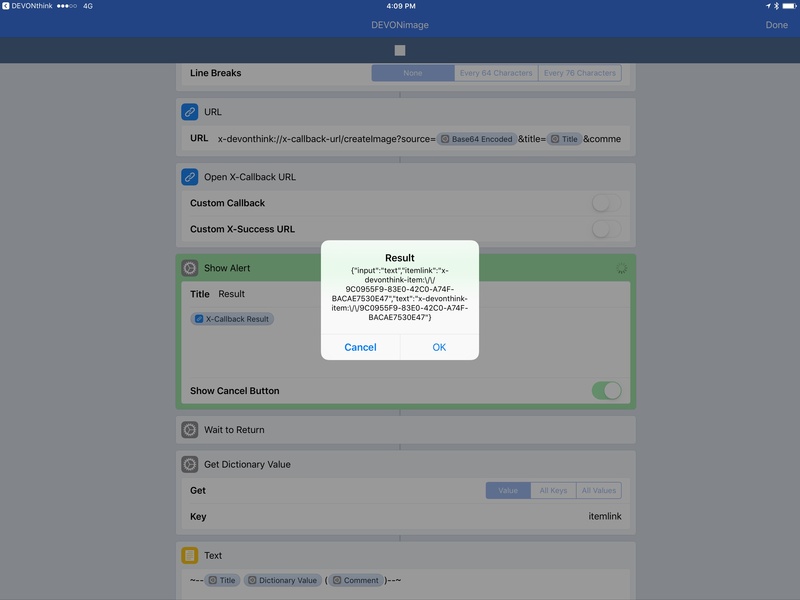 After successfully creating an image, DEVONthink knows that it needs to launch Workflow again, and it'll do so by sending a JSON object with metadata for the newly created file. All it takes for Workflow to interpret this data is a 'Get Dictionary Value' action. This idea is the centerpiece of DEVONthink's new automation, which explains why these URL schemes are best experienced in Workflow's visual playground rather than other, more limited launchers. 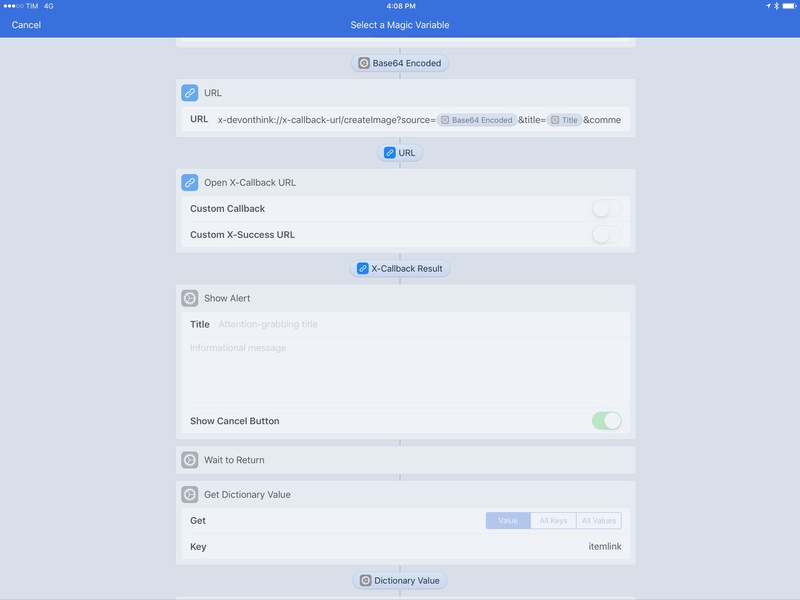 The result of x-callback-url automation can be used as a Magic Variable in Workflow. 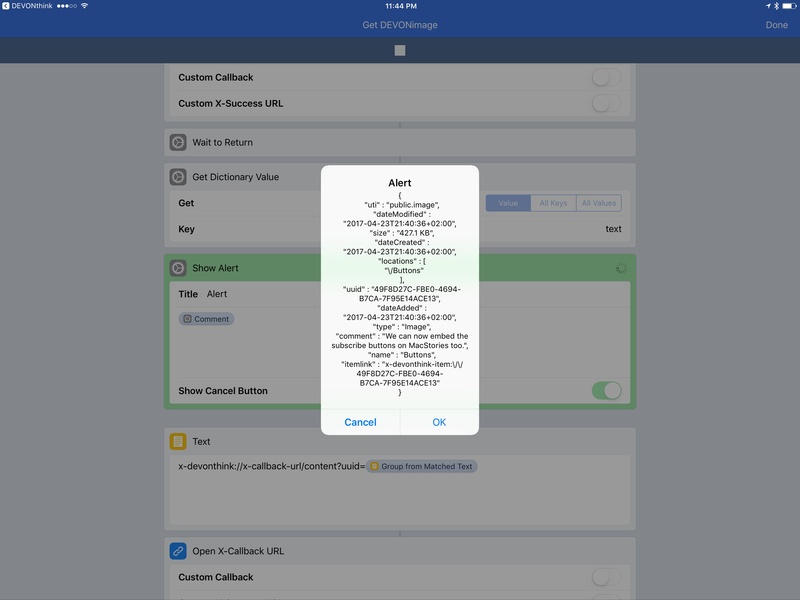 We can use an Alert to inspect the text sent back by x-callback-url as a dictionary. What x-callback-url's JSON looks like as a dictionary under the hood. In practice, you'll never have to deal with this. This workflow alone has been a game changer for how I can take screenshots and save them somewhere I can reference them later. After years of trying to find old screenshots in Photos or, worse, having to manually import images one by one in Scrivener, I now have a system to archive images, add comments to them, and automatically organize them. This workflow is going to become my most used one for longer stories and app reviews. You can get the workflow here. The same technique that powers the createImage command – sending file attachments as base64-encoded strings – works for saving other documents in DEVONthink as well, such as PDFs. Using the Workflow extension with the 'Get Type' action, we can build a "smart extension menu" that sends a different command to DEVONthink depending on the file a user has shared with the extension. 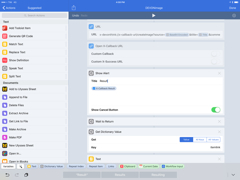 The workflow's ability to discern multiple formats is made possible by the app's understanding of file types, but we also have to highlight the new commands and changes brought to DEVONthink in its latest release. 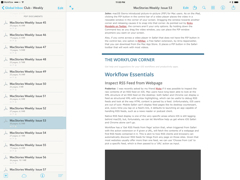 Once created, files can relaunch Workflow and pass their unique DEVONthink links to the app. 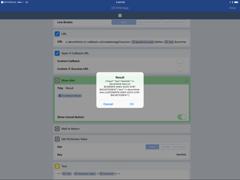 This versatility is the result of DEVONtechnologies' adoption of a rich set of x-callback-url commands; at this point, I'd say DEVONthink and Ulysses are the most flexible and powerful implementations of URL schemes optimized for Workflow on iOS. The "optimized" qualifier is there for a reason: with the workflows I made, you never have to see or edit the URL schemes themselves. The actions I used are meant to abstract the complexity of URL schemes2 and provide an automation environment that "just works". 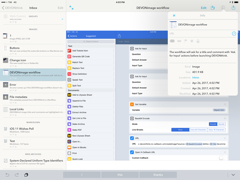 Saving a PDF from iCloud Drive. The PDF was encoded to base64 and sent to DEVONthink, which decoded it and saved it as a regular PDF. The comment is also attached. DEVONthink passes the item's name and unique link back to Workflow at the end. Whether you've selected some text or are sharing a PDF from the share sheet, you can invoke the DEVONmenu workflow, add a title and an optional comment, and save everything to DEVONthink. Unlike the default DEVONthink extension, this workflow will allow you to quickly save multiple documents at once, with comments, and with unique links for each document copied into the clipboard at the end. The DEVONmenu workflow supercharges DEVONthink's Save dialog with automation and Workflow's integrations; I'm using it every day. What happens when you want to fetch a file you've already saved in DEVONthink, though? I'm glad you asked. Just like DEVONthink supports saving files through the URL scheme via an encoded text string, the same idea works in reverse – you can read files from the URL scheme by decoding a base64 string. If you use Workflow, decoding a base64 string takes only one action, which will return the original file as a Magic Variable. And obviously, the fastest way to retrieve a specific file already in DEVONthink involves the option I've added to all my workflows: unique item links. 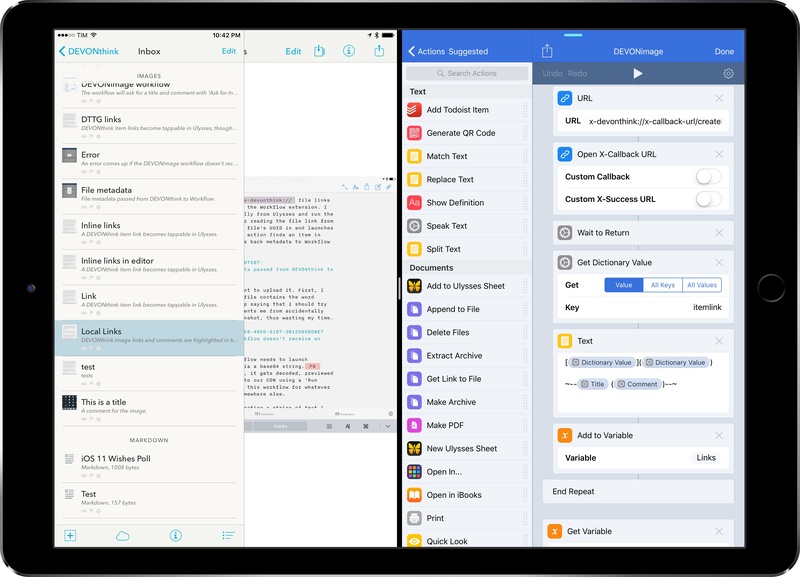 I've always struggled to save screenshots for app reviews and articles while I was researching or writing them. Eventually, they'd get lost in Photos or I'd accidentally delete them. With DEVONthink and its item links, however, I've found a way to save images in an app that can expose them externally with links. So after solving the problem of quickly saving screenshots through automation, I turned my attention to the other end of my writing workflow – turning image references from my Markdown notes into actual image files. 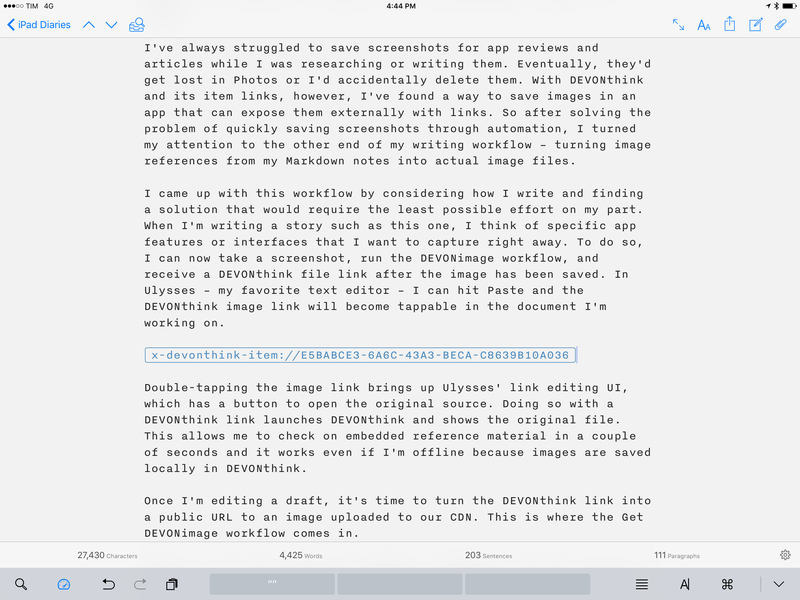 A DEVONthink item link can become tappable in Ulysses, but it takes some editing. 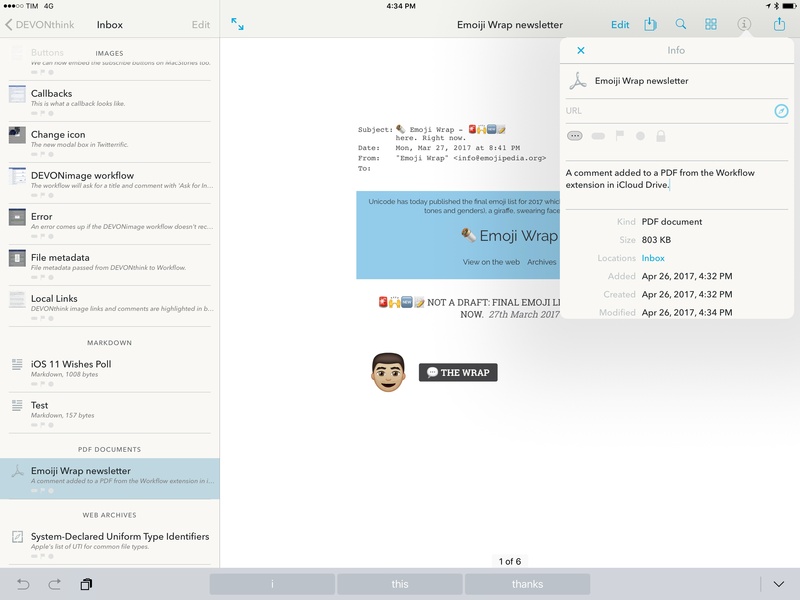 Double-tapping the image link brings up Ulysses' link editing UI, which has a button to open the original source. Doing so with a DEVONthink link launches DEVONthink and shows the file. This allows me to check on embedded reference material in a couple of seconds and it works even if I'm offline because images are stored locally in DEVONthink. Once I'm editing a draft, it's time to turn the DEVONthink link into a public URL to an image uploaded to our CDN. This is where the Get DEVONimage workflow comes in. Thanks to its new automation commands, DEVONthink can now provide Workflow with two distinct kinds of details about a file: its metadata or its contents. Metadata include information such as the filename, creation date, and comments; the file contents are a base64-encoded string that can be decoded by Workflow into a native file. Using these two commands, I can first confirm that a file still exists in DEVONthink, and if it does, transform its base64 representation into an image available on the web. 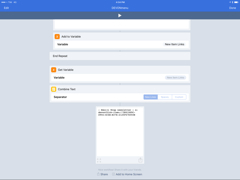 The workflow I've put together accepts x-devonthink:// file links either from the clipboard or shared with the Workflow extension.4 After reading the file link from the clipboard, the workflow isolates the file's UUID and launches DEVONthink with the item command. This action finds an item in DEVONthink's database by its ID and sends back metadata to Workflow using x-callback-url. File metadata passed from DEVONthink to Workflow. At this point, if the image exists, I want to upload it. First, I make Workflow check that the UTI of the file contains the word "image". If it doesn't, an alert comes up saying that I should try again with another file. This check prevents me from accidentally uploading, say, a PDF instead of a screenshot. An error comes up if the DEVONimage workflow doesn't receive an image file. If the file is indeed an image, the workflow needs to launch DEVONthink again to fetch its contents via a base64 string.5 Once the file is passed back to workflow, it gets decoded, previewed with Quick Look, and, finally, uploaded to our CDN using a 'Run Workflow' action. You'll want to replace the upload action with whatever you use to upload images or save them somewhere else. The Get DEVONimage workflow ends by generating a string of text I can paste in my Ulysses document. This text contains the image's new public URL and the file's comment, the latter directly fetched from DEVONthink. All I have to do is paste the text in Ulysses and format it as a Markdown image with a comment. In a couple of seconds, I've gone from a reference for a local file stored in DEVONthink to an image uploaded to our CDN that retains its original comment. DEVONthink image links and comments are highlighted in blue with my custom Ulysses theme. 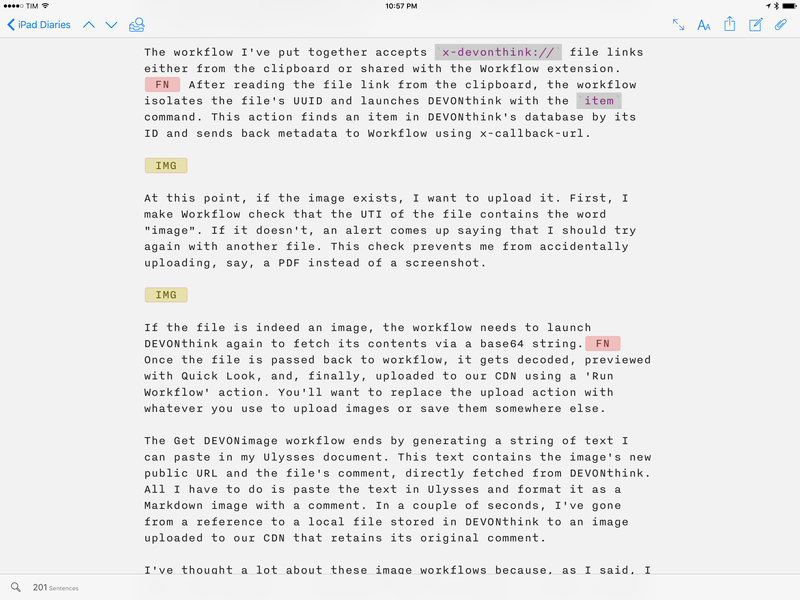 Markdown image links in Ulysses. There are a couple of ways this setup could be improved. First, I have to consider creating dedicated groups in DEVONthink for different articles I'm working on, as right now all images are saved in the global inbox. 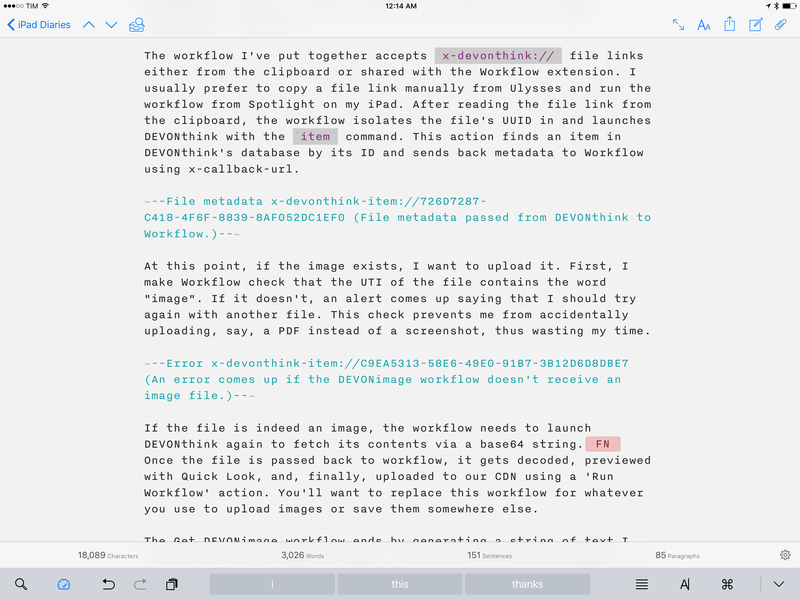 Furthermore, Ulysses needs to support 'Paste as Markdown' – an option that has been available in the Mac version for years and that is still absent from the iOS app. With the ability to paste text as Markdown, I could create an IMG tag (instead of the blue highlighted text) as soon as I have a DEVONthink image link. 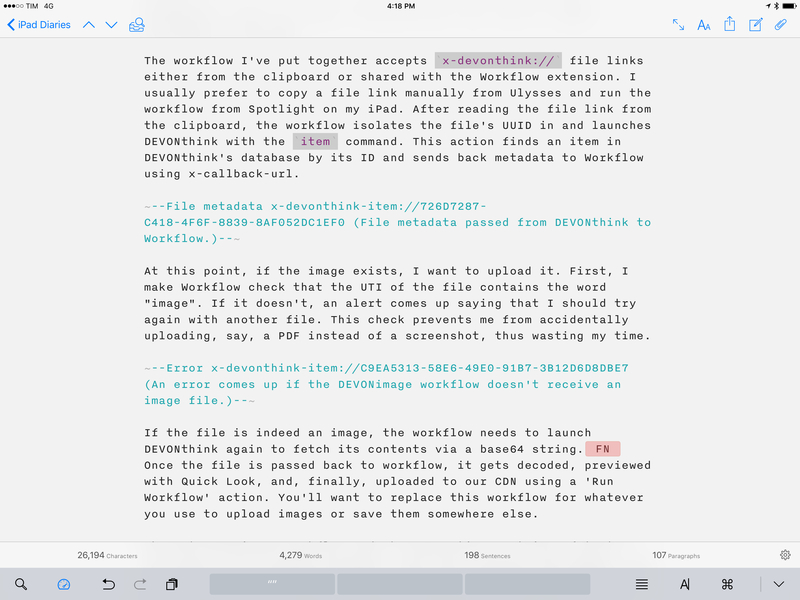 Also, if I could choose one Scrivener feature to have in Ulysses, that would be an option to create arbitrary color highlights for text; that would allow me to easily distinguish portions of text within a document at a glance instead of using the app's 'Raw Source' button to highlight lines of text in blue. 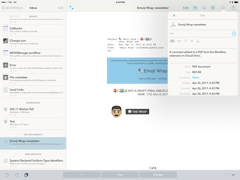 I'm happy with the system I've established in DEVONthink, Workflow, and Ulysses. 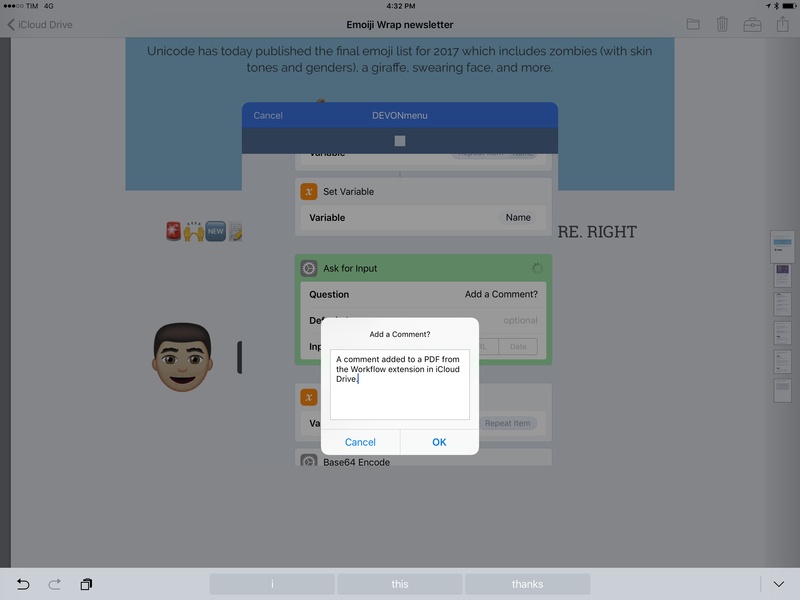 Keeping reference material in a separate app and connecting DEVONthink with Ulysses through Workflow enables me, among other things, to change image descriptions in DEVONthink, where it makes more sense to add comments to files. The screenshots in this story were all saved, embedded, and uploaded with this workflow, and I look forward to using it for bigger projects this year. 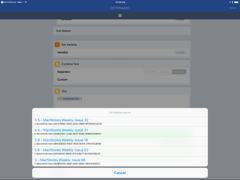 The final major addition to DEVONthink automation is the ability to start searches in the app and pass results back to Workflow with metadata for each result. 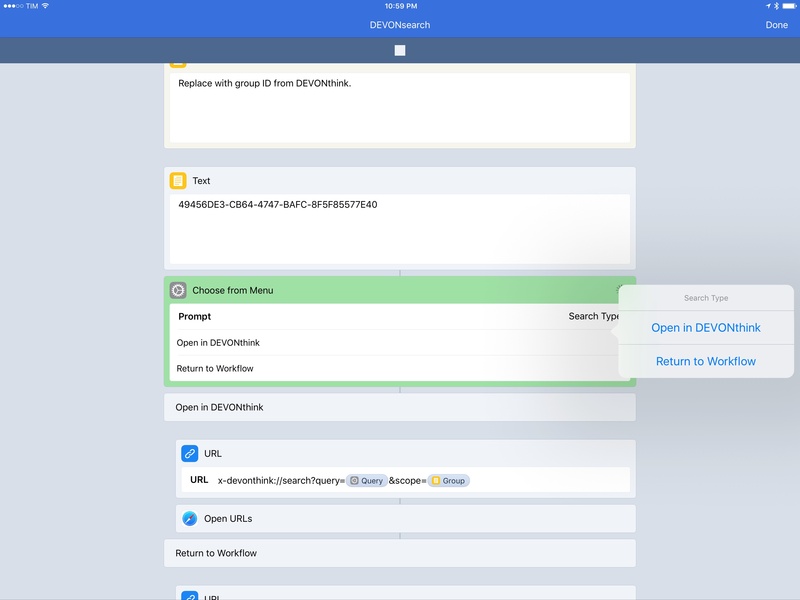 I covered DEVONthink's advanced search features in my previous coverage of the app – specifically, I focused on DEVONthink's NEAR operator to find words close to each other in PDF documents. My DEVONthink database isn't too big yet, but I've been running searches on a regular basis to find sections in past issues of MacStories Weekly and comments added to images or web archives. With automation, there's now a faster way to launch these advanced searches. 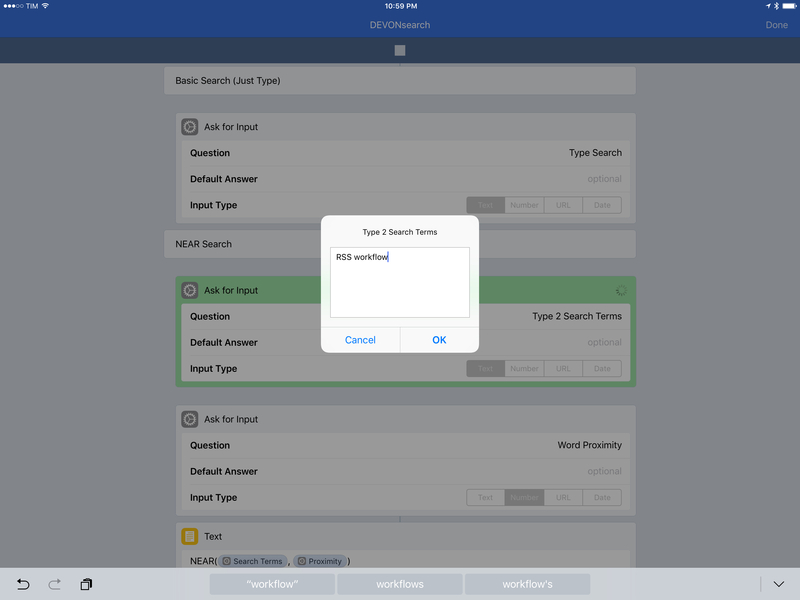 Effectively, the latest DEVONthink allows us to create saved searches in Workflow and open them in DEVONthink. 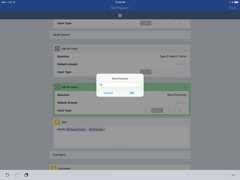 There are two ways to search via automation: we can prepare a search query in Workflow and open the search screen with results in DEVONthink, or we can issue the search command from Workflow, temporarily launch DEVONthink to fetch results, and go back to Workflow to view results and process them. 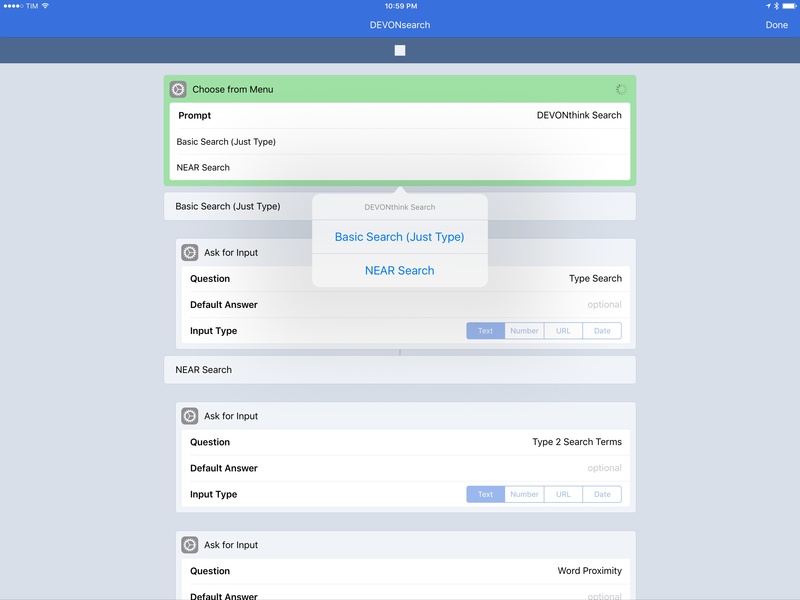 To understand the limitations and possibilities enabled by automated DEVONthink search, I created a workflow that offers a total of four options. A search can either be a basic one (just type a search query), or it can be a NEAR search; if you don't want to use that operator, just swap it with another one. 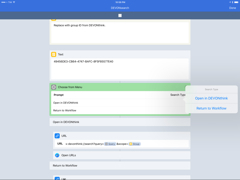 Then, the search can either stay in DEVONthink (so you can tap and preview results in the app), or it can kick you back to Workflow, which will parse results and display them in a list. Starting a DEVONthink search in Workflow. Two search terms for a NEAR search. Word proximity has to be entered with a number. 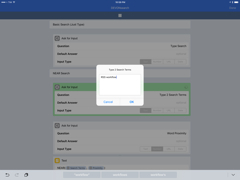 You can choose to view results in DEVONthink or return to Workflow. Search results sent back to Workflow. The result we picked, viewed in DEVONthink. I don't have a particular use case for feeding search results back to Workflow yet, but I added the option nonetheless as I wanted to understand the system and build a proof of concept for others to iterate upon. The idea of a powerful app such as DEVONthink offering an x-callback-url search API that exposes rich results to other apps is an intriguing one. Performing additional filtering of results in Workflow by excluding file types or date ranges could be a possible use case; another could be to search for all files in a group and iterate over each item by opening its link, reading the file, and going back to Workflow. While both search methods would yield the same results, only one of them can be automated and integrated with other apps; I'm curious to see what other users will come up with. I've mostly been using the DEVONsearch workflow to trigger NEAR searches from a widget. Unlike the other commands, I'm still experimenting with search, but I believe it has some serious potential. The folks at DEVONtechnologies have been improving DEVONthink To Go at a remarkable pace over the past few months. 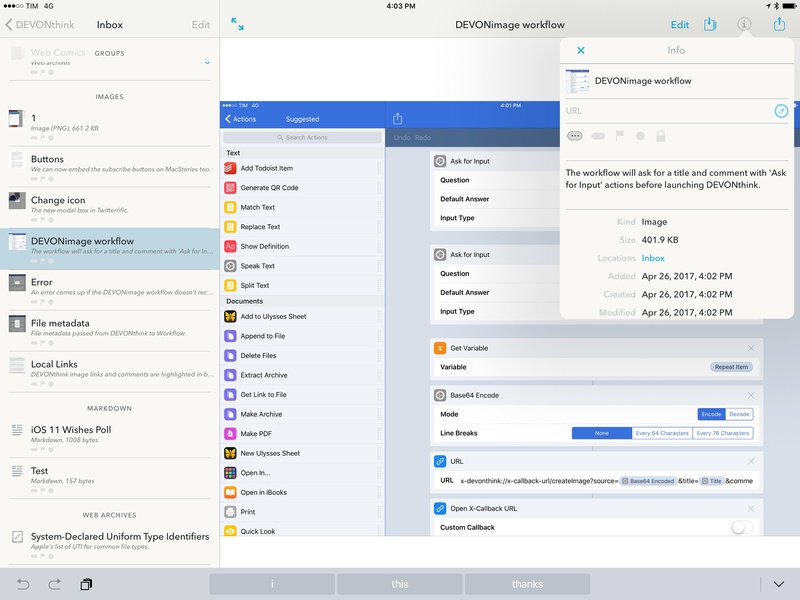 As I argued in February, DEVONthink had already set a new standard for file managers on iOS thanks to its advanced search features and support for multiple document types. 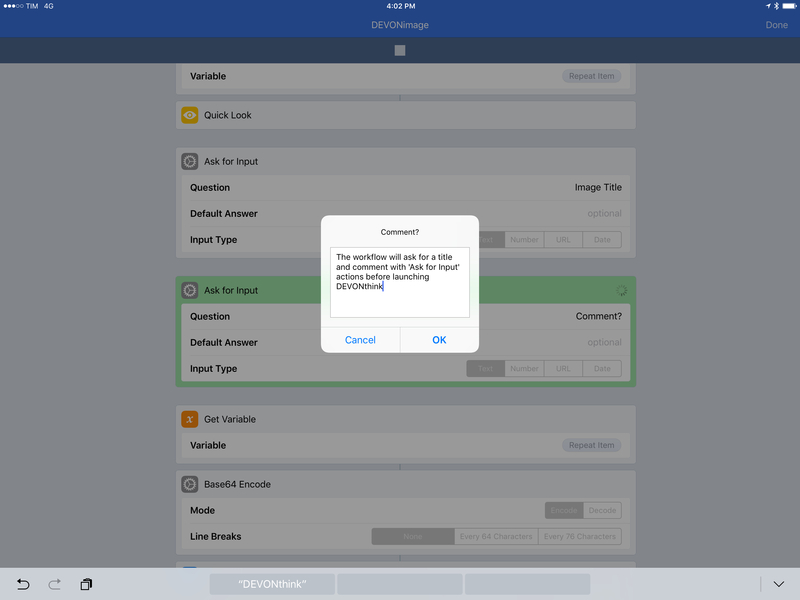 With its new automation, DEVONthink sets a standard for other pro apps on iOS, period. DEVONthink's new automation features have provided a stronger foundation for managing my articles' assets and research material. I've always wanted a system to embed local file references to be processed at a later stage, and this is exactly what I had in mind. 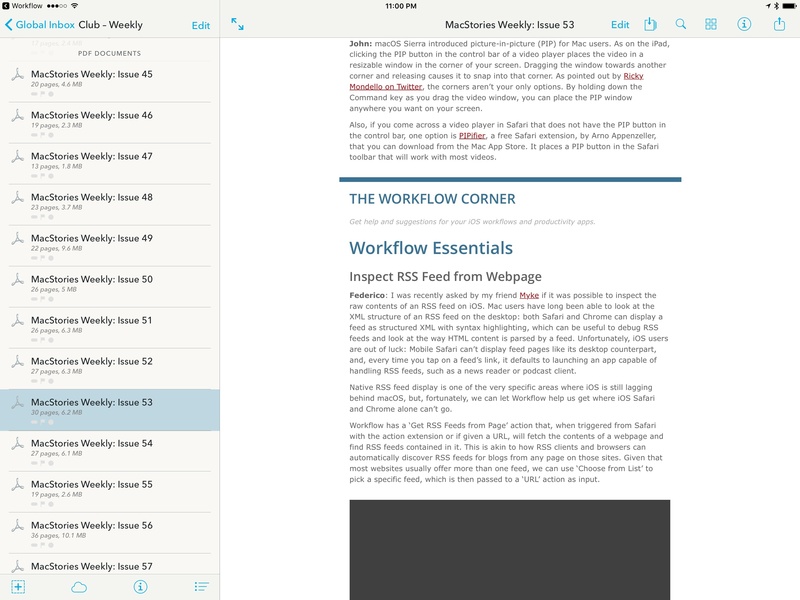 I'm also increasingly switching to PDFs and web bookmarks archived in DEVONthink now that the app can be integrated with Safari and email clients via Workflow. 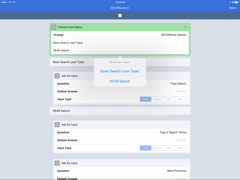 I'm still thinking about how to implement searches in Workflow, but I have some ideas. DEVONthink, Ulysses, and Workflow have become key elements of my writing and research workflow; I expect these automations to go even deeper in the next few months. This is going to be fun.